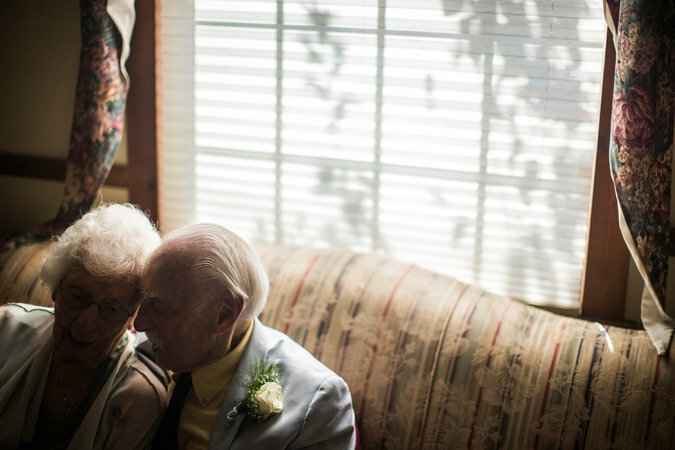 From the NYT: a beautiful love story and they’re in their 90’s! while probate court is stealing lives and money and destroying families in many unresolved cases already published on this blog, some stories are on the other end==hope and love and life even into their 90’s. Gertrude Mokotoff and Alvin Mann were introduced eight years ago at a gym in Middletown, N.Y., where they still work out twice a week. “A mutual friend said to me, ‘I’d like you to meet a very nice young lady,’” Mr. Mann recalled after chopping wood one recent morning at his mountaintop home in nearby Cuddebackville, N.Y. In a heartbeat, they became an item, talking about dreams and goals and sharing a life together. Mr. Mann, who had seen the world through the eyes of a young United States merchant seaman, returned from troubled seas and found enough peace and quiet in Cuddebackville to focus on getting a college degree. Ms. Mokotoff, five years his senior, had designed a home on a high ridge in Middletown and was eager to fill it with good company. He held on tighter with each passing season, and then in June, after one of their many late-night drives home from the Metropolitan Opera House in Manhattan, she decided to buck tradition. When their guitarist began strumming “Somewhere Over the Rainbow,” Ms. Mokotoff, clutching a small bouquet of white roses, emerged from a side room and began walking slowly toward her future husband, his eyes welling with tears. Everyone in the old courtroom was smiling, especially Father Time. “This is like an early birthday gift,” Ms. Mokotoff said before joining hands with Mr. Mann. She was looking ahead to Aug. 20, a day when the newlyweds will most likely have to work together to blow out the candles on Ms. Mokotoff’s birthday cake — all 99 of them. 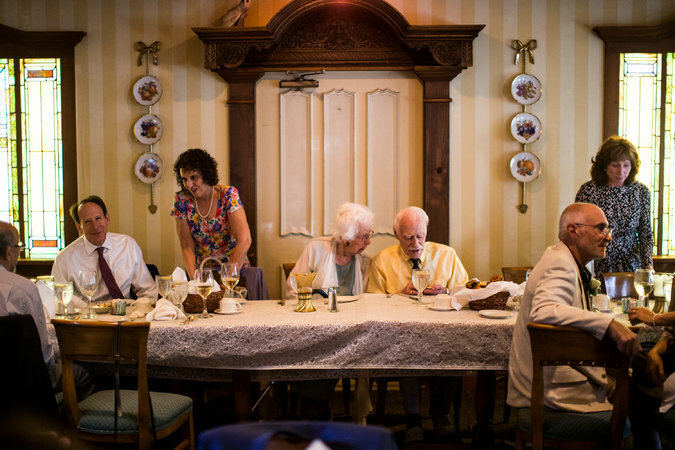 Mr. Mann, who is 94 and received a bachelor’s degree in history last year from Mount St. Mary College in Newburgh, N.Y., agreed that when it comes to being old as opposed to feeling old, the numbers don’t always add up the same. 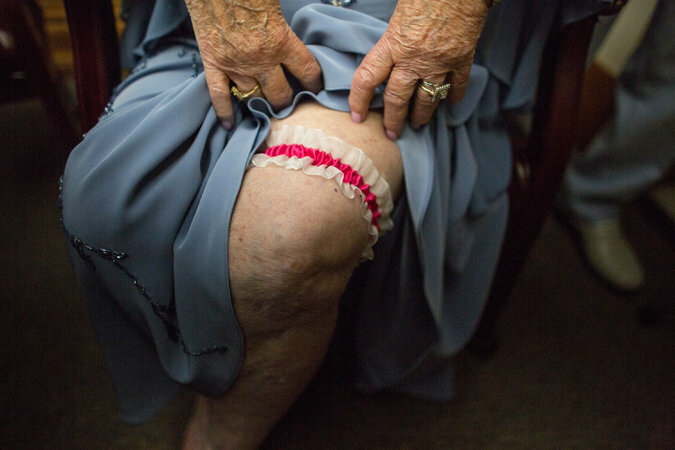 Long before they were introduced in the gym, the lives of Ms. Mokotoff, a former mayor of Middletown, and Mr. Mann, a retired businessman, had fully taken shape. Both are widowed from previous marriages, and they have seven children, 12 grandchildren and seven great-grandchildren between them. Ms. Mokotoff, who was born in Brooklyn in 1918 to Anna Fox and Abraham Fox, a tailor, graduated from Brooklyn College and received a master’s degree in biology from Columbia. As a 23-year-old in 1941, she married Reuben Mokotoff, a cardiologist from Manhattan, where they lived until 1952. She then persuaded him to relocate his practice to Middletown, where Ms. Mokotoff would become a wildly popular and well-regarded figure. For more than three decades, she was a biology professor, teaching medical technology and microbiology, at Orange County Community College, in Middletown, where she is now a trustee. She also started the first training program for electron microscopy technicians, all while raising four children. Instead of simply retiring in her late 60s, Ms. Mokotoff decided to give politics a try and was twice elected an alderwoman in Middletown, winning her second election by a single vote. As mayor, she was credited with spearheading the creation of a modern library in town, and for refurbishing and revitalizing the old Paramount Theater, which was built in the 1930s. She had been married for 61 years at the time of her husband’s death in 2002. “My mother has always been a very bold woman,” said the bride’s oldest child and maid of honor, Susan Mokotoff Reverby, 71, herself retired after a 34-year career in women’s and gender studies at Wellesley. Mr. Mann was born in Manchester, N.H., on May 24, 1923. The son of Mae Mann and Hyman Mann, an insurance executive, he joined the war effort in 1943 as a 19-year-old, eventually serving as a second engineer aboard cargo ships, tankers and troop ships during World War II. Already married by the time he was honorably discharged in 1947, he opened a business in Manhattan, Temporary Office Services Inc., that provided short-term secretarial and clerical help to other businesses. Mr. Mann’s first marriage, which lasted 20 years before ending in divorce, produced his only biological child, Mark Mann, now 71, who served as best man. His second marriage, to Maybelle Kart, an art historian and artist from Great Neck, N.Y., who had two daughters, lasted 45 years until her death in 2007. 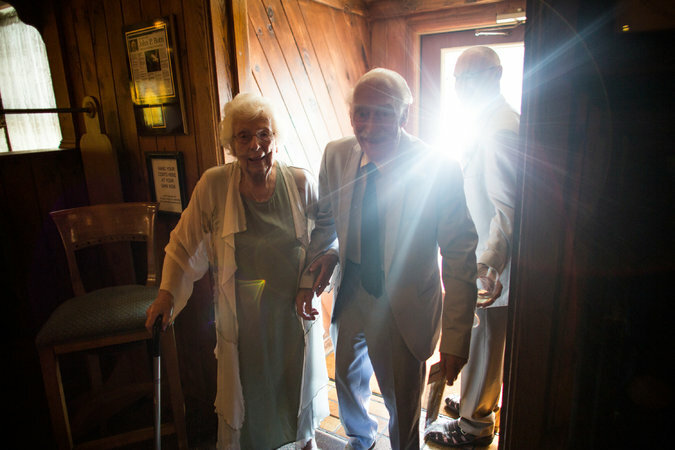 Last year, Mr. Mann became the oldest person to graduate from Mount St.Mary College. The college also awarded him an honorary doctorate this past May. At 93, he drove 80 miles round trip twice a week for nearly two and a half years to accrue the 30 credits needed to obtain a degree he had started working on in his 70s, while he owned another home in Tequesta, Fla. He racked up 60 credits at nearby Palm Beach State College, and 30 more at Florida Atlantic University, before finishing up at Mount St. Mary. During the ceremony, the groom entertained his guests with several stories about his new bride, including her first-ever sleepover at his home. After exchanging vows and wedding rings, the couple were showered with applause, well wishes and hugs, as several of the guests began to cry. “Their enthusiasm is contagious and their certainty of a destiny together is inspiring,” said Mayor DeStefano, who is Ms. Mokotoff’s political protégé. “We ask that the vision they have for one another always reflects the attraction that first brought them together,” he said before pronouncing them husband and wife. After the ceremony, Mr. Mann managed to slip out a back door and, moments later, reappeared in front of City Hall, behind the wheel of his red Toyota Corolla. 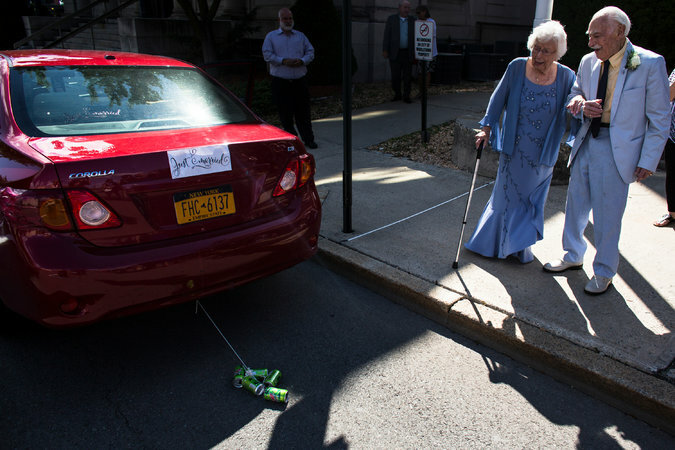 As the guests began spilling onto the sidewalk, he stepped on the gas pedal and zipped past them down the street, noisily dragging soda cans tied to the back bumper below a sign that read “Just Married.” He took it for a spin around the block before returning to pick up his new wife. “This is fabulous,” said Charles Mokotoff, the bride’s son, an internationally known classical guitarist who lent his musical talents to the ceremony. Shortly thereafter, the couple and their guests resurfaced at John’s Harvest Inn, a nearby restaurant where the reception was held. Just before dinner, the bride raised the roof, and the groom’s eyebrows, when she sat in a chair and hiked up her wedding dress just above her knee to reveal that she was wearing a garter. The groom was then asked how his life might change now that he’s a married man, again. Where Middletown City Hall, Middletown, N.Y. True Blue The bride wore a blue Unique Couture dress, and the bouquet of white roses she carried matched the boutonniere pinned on the groom’s light blue suit, made by International Concepts.